It is Emaline’s last summer before she heads off to college, and she's spending it in her hometown of Colby, working for her family's realty company and spending time with her long-time boyfriend, Luke. But her quiet summer suddenly gets much more interesting when her estranged father and half-brother show up in Colby for the summer, and she unexpectedly breaks up with Luke...only to immediately start dating Theo, the opposite of Luke in almost every way. Emaline is attracted to the pull and promise of new experiences and an exciting life outside of Colby, but can she balance that desire with a need to stay attached to her family and small town roots? Sarah Dessen returns once more to the beach town of Colby with her latest novel, which is the perfect setting both because of its charm and its duality that mirrors Emaline's conflicted feelings over her future. Emaline is easily drawn into the glamour of the life that her father wants for her at an Ivy League university and Theo's ideas of culture and excitement, but she still wants to feel connected to her townie roots and dislikes how easily they are dismissed by outsiders. 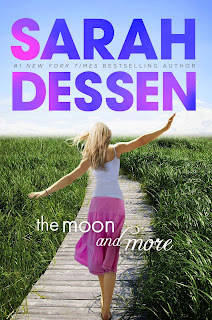 The depiction of the setting is a lot of fun—previous characters and favorite settings from Dessen's earlier works are revisited and fleshed out even more alongside new places. Dessen's narrative is fluid and drifts between past and present rather pleasantly. Her pace feels a lot like the progression of summer; alternately meandering and rapid. Dessen writes about Emaline's relationships really well, and explores the nature of complacent relationships that are easy, and those that jolt you out of complacency. Through her romantic and familiar connections, Emaline becomes more independent and confident, and the book concludes with the perfect imperfect ending. The Moon and More is both a great beach read and a thoughtful exploration of the nature of mistakes, expectations in life, and finding a balance between where you are going and where you come from. Cover Comments: This cover is so pretty! I love the beachy scene and the brought colors, and I like how it appears that the cover model is attempting to keep her balance, as balance is a big theme throughout the book. Very nicely done! The Moon and More will be released on June 4th, 2013! I've been a Sarah Dessen fan for quite a while, so I was excited to see she was releasing a new book. However, after reading this one I was rather disappointed. The plot and character development were seriously lacking, and the storyline wasn't as enchanting as her previous books. Overall, I found it kind of a boring read. Would recommend reading The Truth About Forever, This Lullaby, or Dreamland instead.